Phil Martelli has been let go by St. Joe's. Another era of Big 5 basketball is ending. A big, boisterous era. 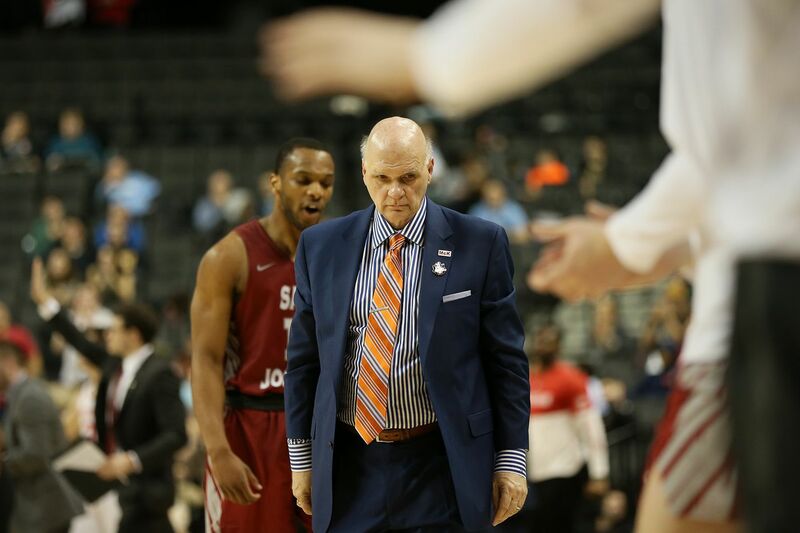 Phil Martelli, head coach of the St. Joseph’s Hawks since 1995, has been fired, according to a source who said Martelli was informed of the decision Monday. St. Joe’s announced the decision later Tuesday morning. According to several sources, the team was informed in several meetings Tuesday morning, first with Martelli, then with administrators. This is a big move on Hawk Hill, considering Martelli was the face of the school. In a phone interview, athletic director Jill Bodensteiner said she made the decision mutually with St. Joseph’s president Mark C. Reed. Coach Phil Martelli of St. Joseph's pauses in a contemplative moment before their game against of Davidson on Jan. 15, 2019. A source said Martelli had several years left on his contract. Martelli has not yet responded to a request for comment. Bodensteiner said that after she was hired last June — coming from Notre Dame, where she was a senior athletic administrator — to replace longtime athletic director Don DiJulia, she spent much of the year evaluating all aspects of the department. “A particular amount of time was spent evaluating” the men’s basketball team, she said, including traveling with the team, meeting with recruits. She went on to say she has “every respect” for Martelli and his staff. Martelli, who will turn 65 in August, was the national coach of the year in 2004 after leading the Hawks to an undefeated regular season and an appearance in the NCAA Tournament’s Elite Eight. The Hawks reached the second round of the 2016 NCAA Tournament but have had three straight losing seasons since. He coached the Hawks in the NCAA Tournament seven times. 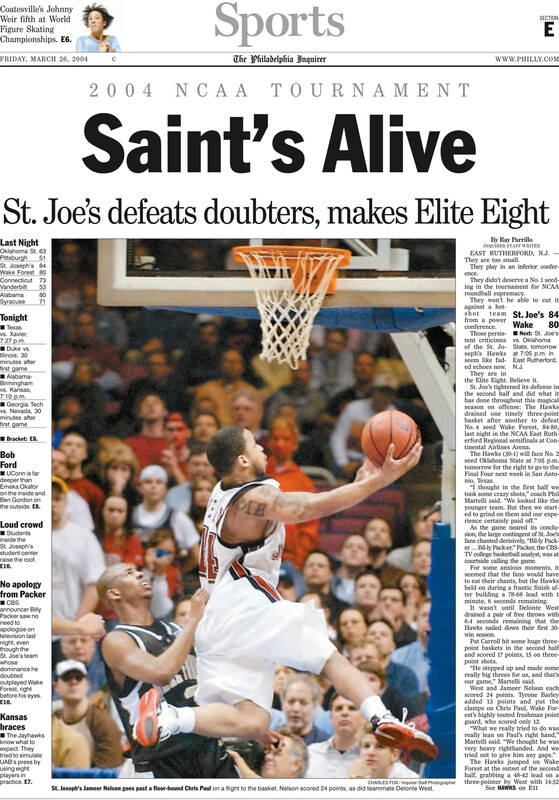 The front of the Inquirer sports section on March 26, 2004. His tenure went beyond X’s and O′s. Martelli and Fran Dunphy, finishing out his own last season at Temple, spearheaded local and national Coaches vs. Cancer efforts, raising millions. Even away from Hawk Hill, Martelli long ago had become one of the most recognizable sports figures in the city, known for his quick wit and tell-it-like-it-is ways. The Hawks team led by future NBA players Jameer Nelson and Delonte West was the high point of Martelli’s tenure, as Nelson was named national player of the year in 2004 and appeared on the cover of Sports Illustrated. A St. Joe’s appearance in that year’s Final Four came down to a made jump shot by Oklahoma State at one end of the court at the Meadowlands and a missed one by the Hawks at the other end. There were other high points. St. Joe’s reached the NCAA Sweet 16 in Martelli’s second season as head coach in 1996-97. More recently, the Hawks won Atlantic 10 titles in 2014 and 2016, and experienced near misses in those NCAA Tournaments, losing in overtime to eventual national champion Connecticut in the 2014 first round, then losing a battle with top seed Oregon in the 2016 season. This season was a disappointment. After two straight injury-riddled, losing seasons, the Hawks were picked to finish second in the A-10, but that turned out not to be, as the Hawks finished 6-12 in the league, tied for 10th, and 14-19 overall after a second-round exit in the A-10 Tournament. Villanova coach Jay Wright was surprised at the move. “It was shocking. It’s sad, really sad," Wright said by telephone before the Wildcats boarded their flight to Hartford, Conn., where they are set to begin defense of their national championship on Thursday against St. Mary’s. “I really think he’s a Philadelphia institution, I really believe it. He’s bigger than St. Joe’s. He’s with Fran in Coaches vs. Cancer, he’s the Big 5, he’s Philadelphia basketball. She knows the process of finding a new coach has to happen quickly. "I think this is an incredible job, in large part thanks to Phil,'' Bodensteiner said. Staff writer Joe Juliano contributed to this story. Coach Phil Martelli of St. Josephâ€™s during their game against UMass on Feb. 2, 2019. It has been a season of disappointments and injuries.